Thinking about improving your car audio? Many music lovers from all around the world can’t stop themselves from thinking about modifying their car’s audio. Well, doing so can be an great way to get the most enjoyment out of your car. The number one reason on why anyone would think about making changes to the audio of a car or to modifying the system entirely is related to the fact that it may have broken down or it may not work as desired any more. When this happens, either just one piece needs to be changed or the whole system, so if this is the case for you, then changing the audio system of your car is definitely the right way to go. Wanting to get more out of your car’s audio may be the second reason on why you should consider modifying the audio. With this in mind, if you happen to be looking for a great brand that can be used, Memphis Car Audio has fans from all over the world who can easily confirm that the company offers some of the best car audio on the market. Leaving these two reasons aside, you may also want to ask yourself whether you consider that you are qualified to take on such a job by yourself or you’re in need of a professional to assist you with the installation of new amps and car audio equipment. With this factor in mind, the price may also play a certain part in your final decision. According to what other people say, it seems that changing the stock audio that your car comes with can actually turn out to be a great thing to do, as car companies try their best to make costs as low as possible and this can have an effect on the quality of the audio in your car. If you do consider yourself a fan of music and would like to hear everything loud and clearly, then yes, you should change your car’s audio. Regardless of your choice, a good tip to follow may be to make sure that you choose a popular company with great products as well. H&K Sound is proud to announce we are now Ohio’s first authorized dealer for CT-Sounds and Execution Audio I should have a little product in next week! Its time to get a remote car starter. Did you know that warming up your car with your keys could get your car stolen and a ticket? 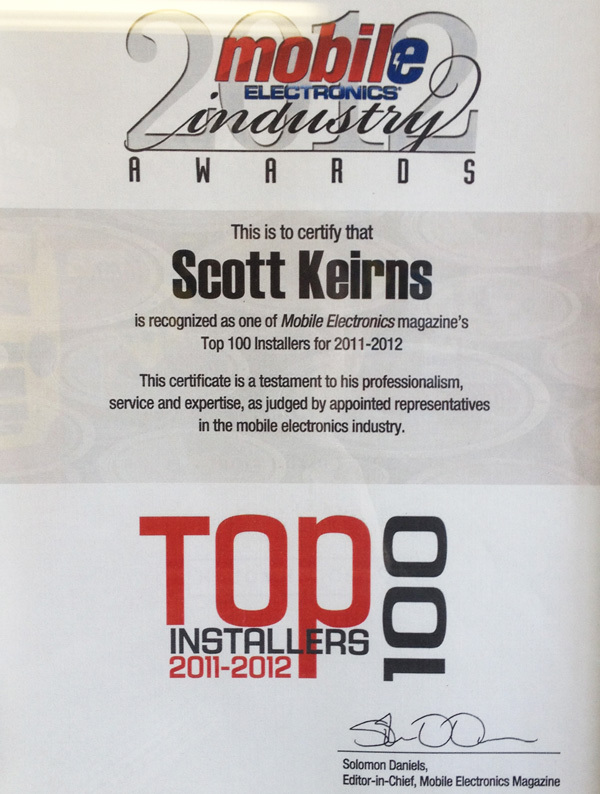 Top 100 Installers of 2012! Did you know we were one of the top 100 installers in 2012? This is just one of our many awards. Stop by to find out what makes us the best at what we do.